This article is about the Chinese state of the pre-imperial period. For the Shatuo state, see Jin (Later Tang precursor). For other imperial Chinese state formations, see Jin dynasty. Jin (Chinese: 晉), originally known as Tang (唐), was a major state during the middle part of the Zhou dynasty, based near the center of what was then China, on the lands attributed to the legendary Xia dynasty: the southern part of modern Shanxi. Although it grew in power during the Spring and Autumn period, its aristocratic structure saw it break apart when the duke lost power to his nobles. In 453 BCE, Jin was split into three successor states: Han, Zhao and Wei. The Partition of Jin marks the end of the Spring and Autumn Period and the beginning of the Warring States period. Jin was located in the lower Fen River drainage basin on the Shanxi plateau. To the north were the Xirong and Beidi peoples. To the west were the Lüliang Mountains and then the Loess Plateau of northern Shaanxi. To the southwest the Fen River turns west to join the south-flowing part of the Yellow River which soon leads to the Guanzhong, an area of the Wei River Valley that was the heartland of the Western Zhou and later of the Qin. To the south are the Zhongtiao Mountains and then the east-west valley of the Yellow River which was the main route to the Wei Valley to the west. To the east were the Taihang Mountains and then the North China Plain. This location gave ambitious Jin dukes the opportunity to move north to conquer and absorb the Xirong tribes, move southwest and fight Qin, and move southeast to absorb the many smaller Zhou states. Also important to the region were the large states of Chu to the south in the Yangtze and Huai River regions and Qi to the east in Shandong. Jin had multiple capitals. The first capital of Jin was Tang (唐). The capital was later moved to È (鄂), then Jiàng (絳), then Xintian (新田). From 746 to 677, Quwo (曲沃) was the capital of a fragment of Jin. When the Zhou Dynasty was founded, the conquered lands were given to Zhou relatives and ministers as hereditary fiefs. King Cheng of Zhou, the second Zhou king, gave the land called Tang (唐), west of modern Yicheng County in Shanxi, to his younger brother, Tang Shuyu (唐叔虞) with the rank of a marquis. Tang Shuyu's son and successor, Marquis Xie of Jin (晉侯燮), changed the name of Tang to Jin. There is little information about Jin for this period beyond a list of rulers. In 771 BCE the Quanrong nomads drove the Zhou out of the Wei River valley and killed the king. Marquis Wen of Jin, the eleventh marquis of Jin, supported King Ping of Zhou by killing his rival, King Xie of Zhou, an act that King Ping heavily rewarded him for. When Marquis Zhao of Jin (745-739 BCE) acceeded the throne, he gave the land of Quwo to his uncle Chengshi who became Huan Shu of Quwo. In 739 BCE, an official named Panfu (潘父) murdered Marquis Zhao and invited Huan Shu to take the throne. Huan Shu entered Jin but was driven out by the people and retreated to Quwo. All three Quwo rulers, Huan Shu (745-731), Zhuang Bo (731-716) and Duke Wu (716-678) made attempts to take over Jin. In 678 BCE, Duke Wu of Quwo conquered Jin and killed Marquis Min of Jin (704-678). One year later, after receiving gifts from Duke Wu, King Xi of Zhou made Duke Wu the legal ruler of Jin, who became known as Duke Wu of Jin (679-677). With the establishment of the Quwo line, Jin became the most powerful state for three generations and remained powerful for a century or more after that. Duke Wu died soon after gaining control of Jin. He was followed by Duke Xian of Jin (676-651 BCE). Xian broke with Zhou feudalism by killing or exiling his cousins and ruling with appointees of various social backgrounds. He annexed 16 or 17 small states in Shanxi, dominated 38 others, and absorbed a number of Rong tribes. Some of the states conquered were Geng (耿), Huo (霍), old Wei (魏), Yu (虞) and Western Guo. His death led to a succession struggle which ended with the enthronement of Duke Hui of Jin (650-637). In 646 BCE, Duke Hui was captured by Qin and restored as a vassal. Another son of Duke Xian was Duke Wen of Jin (636-628), who spent 19 years exile in various courts. He came to the throne in 636 escorted by the troops of his father-in-law, Duke Mu of Qin. Duke Wen quickly established himself as an independent ruler by driving the Di barbarians west of the Yellow River. In 635 BCE he supported King Xiang of Zhou against a rival and was rewarded with lands near the royal capital. In 633 BCE, he confronted the rising power of the southern state of Chu which was then besieging Song. Instead of directly assisting Song, he attacked two vassals of Chu, Cao and Wei. The following year, he formed a military alliance with Qin, Qi and Song that defeated Chu at the Battle of Chengpu, perhaps the largest battle in the Spring and Autumn period. Shortly after the battle, he held an interstate conference at Jitu (踐土) with King Xiang of Zhou and the rulers of six other states. He affirmed the lords' loyalty and received from the King the title of "ba" or hegemon. At some point there was a war with Qin which ended in peace. Duke Wen erected monuments to the fallen on both sides. The Chinese proverb "The Friendship of Qin and Jin", meaning an unbreakable bond, dates from this period. 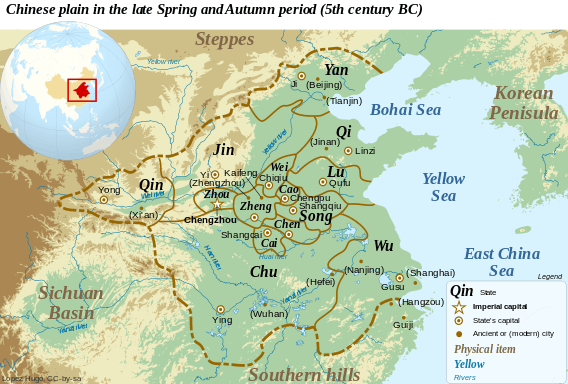 Over the next century, a four-way balance of power developed between Qin (west), Jin (west-center), Chu (south) and Qi (east), with a number of smaller states between Jin and Qi. In 627 BCE, Jin defeated Qin while it was attacking Zheng. Jin invaded Qin in 625 BCE and was driven back the following year. In 598 BCE, Chu defeated Jin at the Battle of Mi. In 589 BCE, Jin defeated Qi, which had invaded Lu and Wei. About this time Jin began to support the southeastern state of Wu as a means of weakening Chu. Duke Li of Jin (580-573) allied with Qin and Qi to make an east-west front against the threat of Chu from the south. In 579 BCE, a minister of the state of Song arranged a four-power conference in which the states agreed to limit their military strength. Four years later, fighting broke out again; Jin and its allies defeated Chu at the battle of Yingling. Duke Dao of Jin (572-558) strengthened the state by internal improvements rather than external wars. He absorbed a number of Rong tribes and was recognized as Hegemon. In 607 BCE, Duke Ling of Jin (620-607) was killed by Zhao Chuan (趙穿) under the orders of his uncle Zhao Dun (趙盾). Prince Heitun was placed on the throne as Duke Cheng of Jin (606-600). This was the beginning of the slow shift of power from the Jin dukes to the ministerial clans. Duke Li of Jin (580-573), the grandson of Duke Cheng, tried to break the power of the clans by fostering conflicts between them. In 573 BCE, he was killed by the Luan (欒氏) and Zhonghang (中行氏) clans. Duke Dao of Jin (572-558) strengthened the ducal power, but could not eliminate the power of the other aristocratic families. After the reign of Duke Zhao of Jin (531-526), the Jin dukes were figureheads and the state was controlled by six clans: Fan (范), Zhonghang (中行), Zhi (智), Han (韓), Zhao (趙) and Wei (魏). The clans soon began to fight among themselves. During the time of Duke Ding of Jin (511-475), the Fan and Zhonghang clans were eliminated. By about 450 BCE, the Zhi were dominant and began demanding territory from the other clans. When Zhao resisted, Zhi attacked Zhao and brought along Han and Wei as allies. After a long siege at Taiyuan, Han and Wei switched sides and the three weaker clans annihilated the Zhi. They then divided the Zhi lands, as well as most of the rest of Jin, among themselves. When Duke You of Jin (433-416) came to the throne the three clans took over much of the remaining Jin lands, leaving the dukes only the area around Jiang and Quwo. From then on, the three clans were known as the "Three Jins" (三晉). In 403 BCE, during the reign of Duke Lie of Jin (415-389), King Weilie of Zhou recognized Marquis Jing of Han, Marquis Wen of Wei and Marquess Lie of Zhao, as marquises of Han in the south, Wei in the center and Zhao in the north, completing the partition of Jin. The state of Jin still nominally existed for several decades afterwards. The Bamboo Annals mentions that in the 20th year of Duke Huan's reign (369 BC), Marquess Cheng of Zhao and Marquess Gong of Han moved Duke Huan to Tunliu, and after that there were no more records of Duke Huan or any other Jin ruler. Modern historians such as Yang Kuan, Ch'ien Mu, and Han Zhaoqi generally consider 369 BC the final year of Jin's existence. List of Jin rulers based on the Records of the Grand Historian and the Bamboo Annals. Shu Yu of Tang 唐叔虞 Yú 虞 1042 BC–? The Records of the Grand Historian (Shiji) also has another Duke Jing after Duke Xiao. However, Shiji's account of the last rulers of Jin is often self-contradictory, and is further contradicted by the Bamboo Annals, which does not mention any Jin ruler after Duke Huan of Jin. Historians such as Yang Kuan, Ch'ien Mu, and Han Zhaoqi generally regard the Bamboo Annals as more reliable, as it was unearthed from the tomb of King Xiang (died 296 BC) of the State of Wei, one of the three successor states of Jin. Duke Huan is therefore generally considered the final ruler of Jin. The Sui dynasty Emperors were from the northwest military aristocracy, and emphasized that their patrilineal ancestry was ethnic Han, claiming descent from the Han official Yang Zhen. and the New Book of Tang traced his patrilineal ancestry to the Zhou dynasty kings via Ji Boqiao 姬伯僑, who was the son of Duke Wu of Jin. Ji Boqiao's family became known as the "sheep tongue family" 羊舌氏. The Yang of Hongnong 弘農楊氏 were asserted as ancestors by the Sui Emperors like the Longxi Li's were asserted as ancestors of the Tang Emperors. The Li of Zhaojun and the Lu of Fanyang hailed from Shandong and were related to the Liu clan which was also linked to the Yang of Hongnong and other clans of Guanlong. Duke Wu of Jin was claimed as the ancestors of the Hongnong Yang. Jin is represented by the star 36 Capricorni (b Capricorni) in the asterism Twelve States, Girl mansion. Jin is also represented by the star Kappa Herculis in asterism Right Wall, Heavenly Market enclosure (see Chinese constellation). ↑ near modern Qucun (曲村). 1 2 Annals of Wei, Bamboo Annals. 1 2 3 Han, Zhaoqi (2010). "House of Jin". Annotated Shiji (in Chinese). Zhonghua Book Company. pp. 3093–3094. ISBN 978-7-101-07272-3. ↑ Peter Bol (1 August 1994). "This Culture of Ours": Intellectual Transitions in T?ang and Sung China. Stanford University Press. pp. 66–. ISBN 978-0-8047-6575-6.